Send your artwork to us "camera ready," meaning that it is in black ink on clean, unlined white paper or posterboard. You can also e-mail the artwork to us. Since your costs are determined by the total number of square inches submitted, place your designs close together. You only need to leave enough room between designs to cut them apart. Determine the total to the nearest image size; for example, an image area measuring 7 1/4" x 9 1/2" = 68 7/8 square inches and will be considered as a 70 square inch area. POLYMER DIES are the printing portion of the stamp. 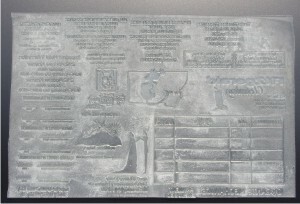 Polymer is a clear plastic material that we expose to ultraviolet light to make a stamp printing die. Excellent for one-of-a-kind stamp production because set-up costs are not incurred (engraving and matrix mold are not required). Very popular for "art stamp" applications where clear stamp dies are preferred for stamped image alignment. Available on request with "removable substrate" for a natural cling to clear acrylic stamp mounts.